We are one of the leading traders, suppliers, distributors and retailers of Interior Decorative Products. In addition to this, we are engaged in offering excellent Interior Decoration Services to our valuable customers. Relying on our expertise in this domain, we are engaged in offering Blinds Curtain to our respected clients. In order to cater the variegated demands of our precious clients, we are offering an excellent quality range of Roman Blinds. 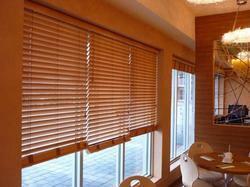 Dimple Glass & Plywood Co.
One of the biggest trends in window treatment styles today is blinds. Window blinds are chic, space saving and easy to use. Zynna offers a range of blinds to suit any interior and decor style.